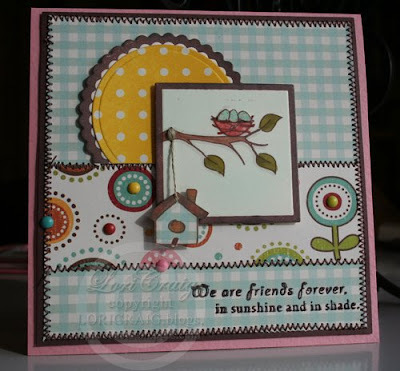 Stamp a Sweet Impression: Our Friday Friend Lori! It's been such a big week here at Taylored Expressions with the new release of both SASI and the new Whimsical Wishes line of stamps! Today we are excited to introduce you to Our Friday Friend - she is someone who has been a sweet true friend to TE from the very beginning on top of being a wonderfully talented stamper. Her incredible Branching Out squirrel card caught our eye last week. Please welcome Lori Craig (stamp_momma on SCS). Vist her blog Make a Difference for tons of inspiration! Lori created this adorable card using Branching Out for today's TECC. We'd love to have you play along too - get all the deets at Taylor's blog after we get to know Lori a little better. -How did you become addicted to papercrafts? How long have you been stamping? I've been stamping for since 1999 - I became utterly and totally addicted when I found Splitcoaststampers in 2004. I love to create cards and special gift projects. I work best when I have a recipient in mind before I start a project. 2 sticks of butter - this isn't Weight Watchers, baby! Bring to a boil: water, cocoa and butter. Add sugar and flour and beat well. Add eggs and beat well. Add soda, buttermilk and vanilla. Bake on a well greased sheet cake pan (mine is a jelly roll pan) for 20 minutes at 400 degrees. Icing: Bring to boil: butter, cocoa and buttermilk. Pour over 1 lb. of powdered sugar. Stir well. Add vanilla and nuts. Spread on cake. This is one of my favorite recipes to make. You can be out the door with a wonderful dessert in 30 minutes - start to finish - because you do not have to wait for the cake to cool before icing it. I love to take this to get-togethers because I can have one piece while we're there and the rest of it just disappears! ** If you don't want to buy buttermilk especially for any recipe that calls for it, simply put 1 T of lemon juice or vinegar in a 1 cup measure. Add enough white milk to fill the cup. Allow it to sit for just a few minutes (less than 5). It will curdle just a little bit and work beautifully for your recipe. If you do purchase buttermilk to make this, freeze the extra in 1 cup increments so you will have it on hand for recipes. Thanks Lori for bing Our Friday Friend! **Create something (card, 3D item, scrapbook page, anything) using one or more images from any SASI oe Whimsical Wishes stamp set. Your creation should showcase SASI or WW, but does not have to be exclusive to SASI. What a darling card, Lori! I LOVE how the birdhouse is hanging. . .so cute! SOOOO darling!! I love the colors and the use of the new stamps!! I am with Charmaine - that birdhouse is just toooo cute hanging like that!!! Awesome job! totally inspirational!! What an adorable card! I've always loved Lori's style and she is a SPER friend as well! One of my favorite peeps! This is totally and utterly ADORABLE!!! Go Lori! Wow Lori - I love the bird house hanging from the branch! Awesome!! Great colours - so spring! I'm loving the card! Oh Lori, this is adorable! Love the birdhouse! So cute! What a lovely card from Lori. Lovely.